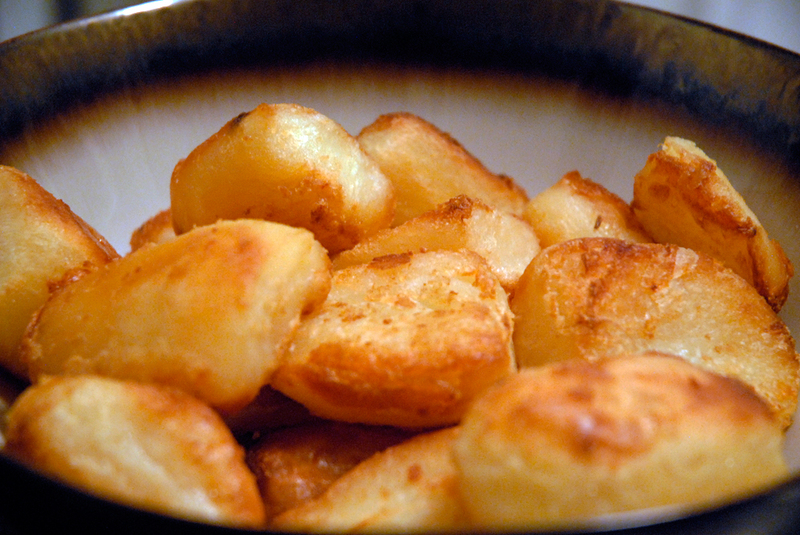 Ah, roasties: Beloved by the Brits, completely foreign to Americans. What is this “roasty” of which you speak, you say? Well, in simple terms, they are roasted potatoes (in fact, that is commonly what they are called in the UK, but if I call them that here it conjures up a different beast). But these are not your typical roasted potatoes. Oh no, they are something far more special. Creamy on the inside with a thick crispy-crunchy crust on the outside, these are the potatoes that are commonly served for a traditional Sunday lunch alongside prime rib, Yorkshire puds. And although they are simple, and relatively easy to make, there is much debate as to the best way to make them and the perfect variety of potato to use. My husband, a Brit, loves them. If I even mention them he gets a faraway look on his smiling face. In fact, unless I plan to make them that very same day, I better not even mention them. I don’t make them very often, but when I do, it’s an event. Like Christmas for example. It took me a while to figure out the right kind of variety of potato to use, as the varieties available in the UK are totally different than those here in America. After much deliberation, I decided upon the russet. It’s important to have a floury potato, but you want it to hold its own and not disintegrate. The method is simple, you peel the potatoes (they are always peeled, so don’t try to get around that part), cut them into relatively large and equally-sized chunks, then par-boil them for a few minutes. This is a very important step because it leads to the next step, which is even more important: once you drain the potatoes you put the lid on the pan and shake it, shake it, shake it to bash up the exterior surface of the potato. This leaves the surface shaggy, and all the better to soak up the hot fat and crisp the potato. Make sure the fat—which can be duck fat, canola or vegetable oil, or even olive oil—is very hot and that you use a large, heavy roasting pan that will hold the potatoes in a single even layer. You want to fry-roast these babies, not steam them. What emerges from the oven an hour later is revolutionary, almost like a deep-fried mashed potato meets a roasted baked potato. These are great alongside just about any roasted meat, like prime rib or rack of lamb, or even braised meats like short ribs or brisket. They don’t keep well, so you better eat them all up when you make them. I doubt you will have trouble. Preheat the oven to 400F. Have ready a heavy roasting pan that will hold the potatoes in an even layer. 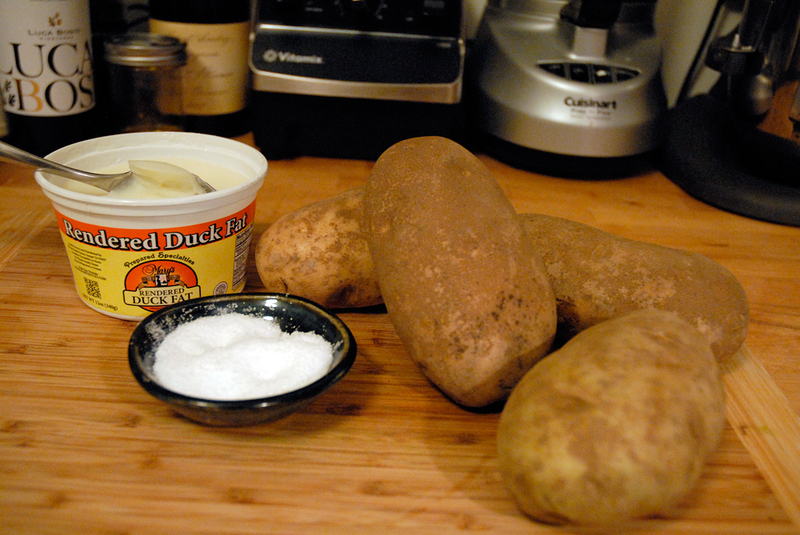 Peel the potatoes and cut them into quarters so they are all about the same size; they should be roughly 2–3 inch chunks. 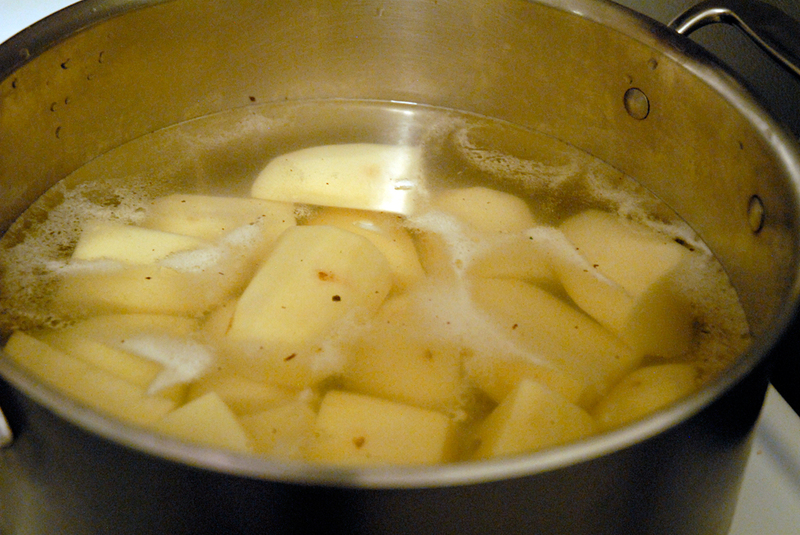 Place the potatoes in a large saucepan and add enough cold water to cover them. Season with plenty of salt and bring to a boil over high heat. Once they boil, stir, reduce the heat to medium, and simmer for 5 minutes. 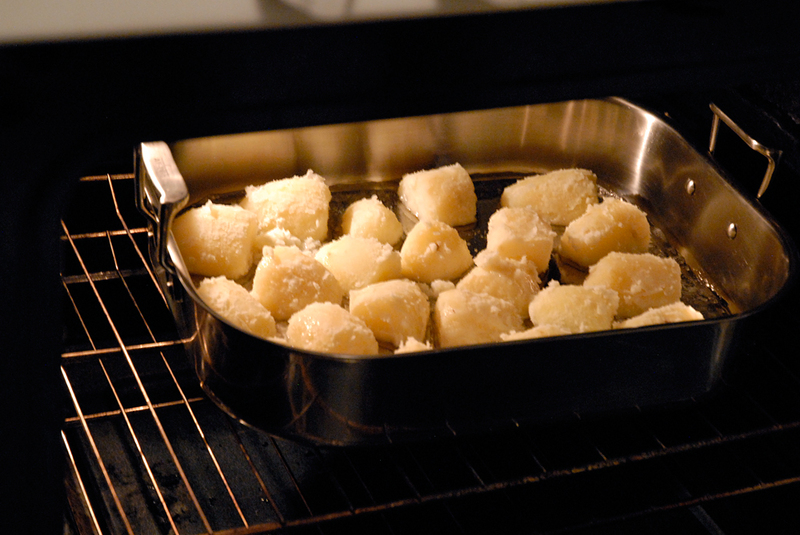 While the potatoes cook, add the fat to the roasting pan and place the roasting pan in the oven to heat. 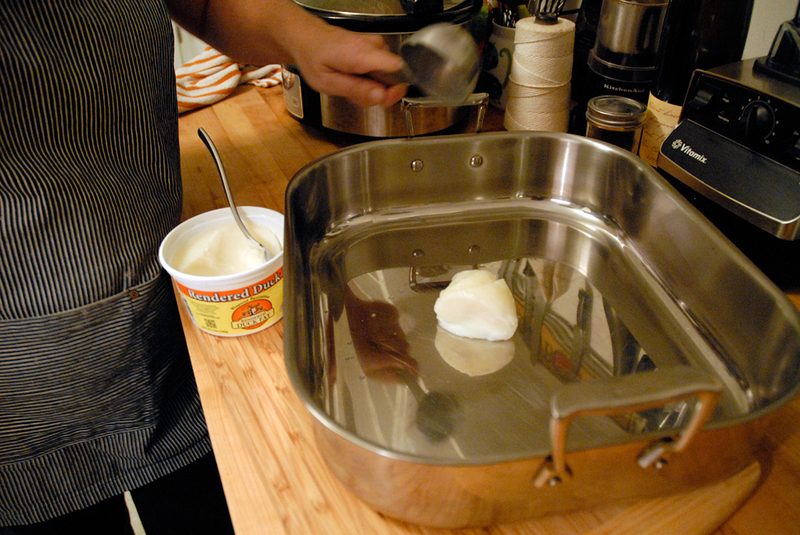 Using the lid, carefully drain the water from the pan. Cover the pan and give it a good shake to bash up the potatoes slightly. 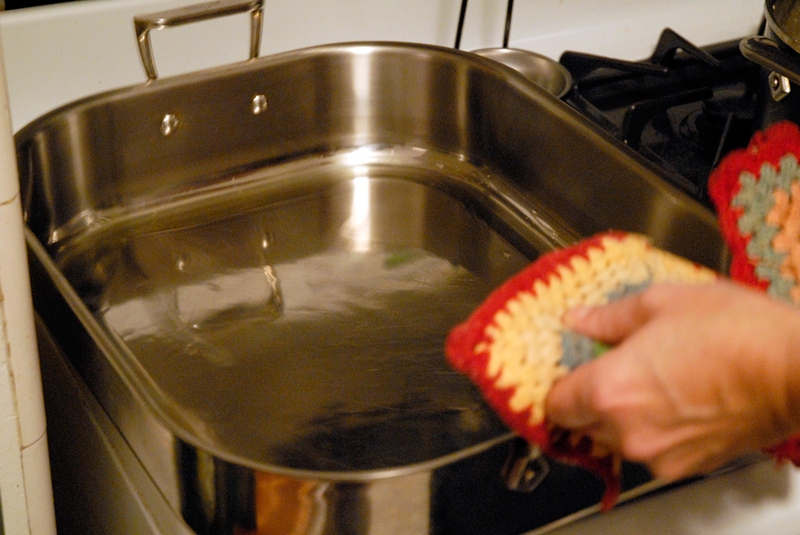 This creates a rough surface all over the potatoes which helps them crisp in the hot fat. 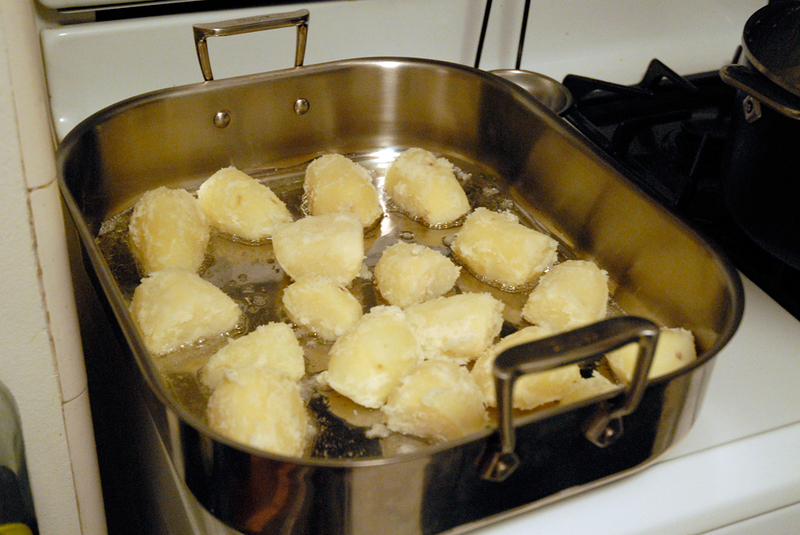 Remove the lid and set the pan aside, uncovered, for the potatoes to dry for a few minutes. 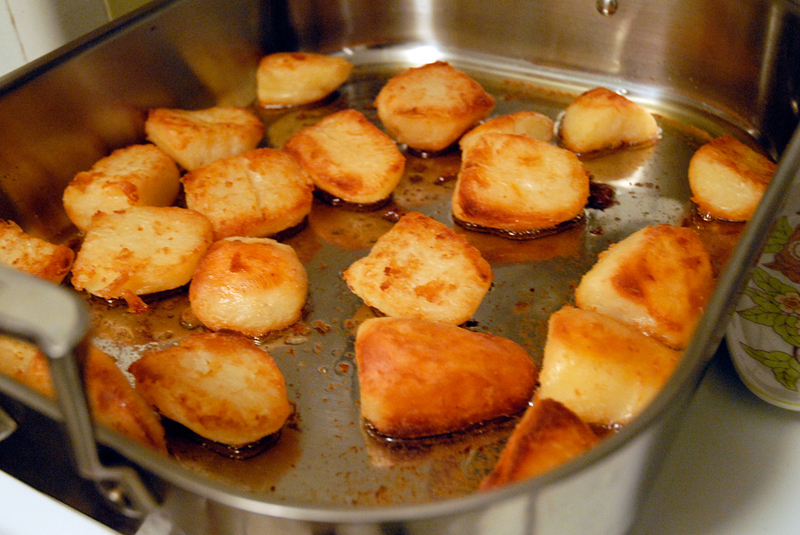 Carefully add the potatoes to the hot fat in a single layer so they are not touching and return the pan to the oven. Roast, turning them about every 15 minutes or so, until they are deeply golden brown and crisp and tender throughout, 60–75 minutes. Serve while hot. 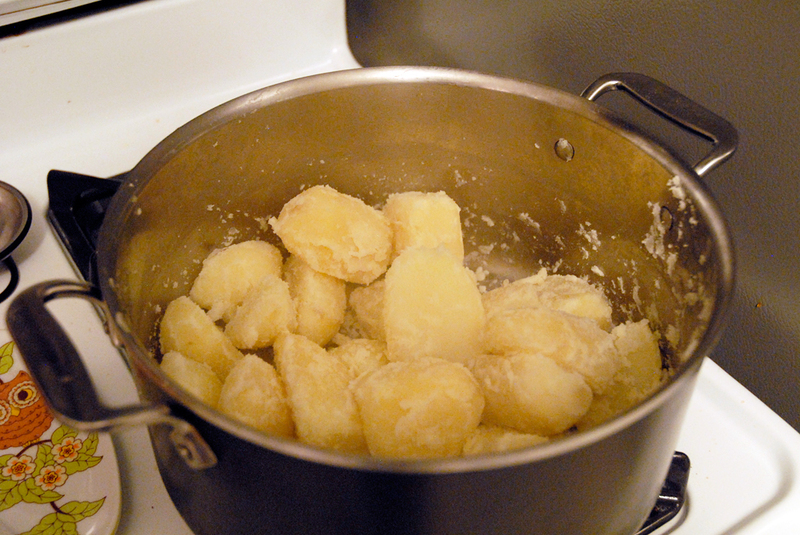 Peel, cut potatoes into 2–3 inch chunks. Place the potatoes in saucepan, cover with cold water, add salt, boil, reduce heat simmer 5 min.